PACK THE MAC: Tickets going fast! TWO. MORE. DAYS. Citadel Basketball's PACK THE MAC is just two days out, as the Bulldogs take on VMI at 1pm on Sat. January 30th at McAlister Field House! Coming off of a record crowd at Pack The Mac last season, limited $5 tickets are going fast at www.PACKTHEMAC.com. But do so quickly, this deal expires January 29th! Get yours today, and we'll see you on January 30th at McAlister Field House-- Go Bulldogs! Charles Courtenay Tew was among the first 26 cadets to report to the Citadel Academy in 1843. He became the Academy’s first honor graduate in 1846 and the first president of the Academy’s Alumni Association in 1852. While serving as Superintendent of the Arsenal Academy in Columbia (made auxiliary to the Citadel in 1845), Tew was given a sword by the cadets. The scabbard of the sword bears a plate engraved “The Cadets of the Arsenal Academy /To Captain C.C. Tew/November 25th 1858.” The collar of the scabbard bears a second inscription: “Captured at Antietam September 17, 1862.” This is the date Colonel Tew was mortally wounded and the sword, taken from him by a Northern soldier, was lost to history. On September 17, 2015, 153 years later, the sword will return to The Citadel, courtesy of the 33 Signal Regiment Foundation of Ottawa, Canada. Please plan to attend a special program on Thursday evening, September 17 at 6:30 in the Daniel Library to hear the story of the sword. The official transfer of the sword from the 33 Signal Regiment to The Citadel will occur on the parade ground on Friday, September 18, just moments before parade. More details on these events will be announced shortly. Wounded Warrior Amputee Softball Team "Battle of Charleston Harbor"
Charleston, SC is looking forward to what is sure to be an exciting game. On March 21, 2015 the Wounded Warrior Amputee Softball Team (WWAST) will be in Charleston, SC for a game against the Citadel Baseball Alumni from the 1990 College World Series Team at the River Dogs Stadium. WWAST is a nationally recognized team comprised of amputee active duty military personnel and veterans. This team of all-stars will battle it out in a softball tournament at the Charleston River Dogs Stadium, "Battle of Charleston Harbor". Carolina Children’s Charity, and The Charleston Miracle League. Join us as we celebrate the resilience of these heroes! 2015 Annual Oyster Roast was a smashing success! 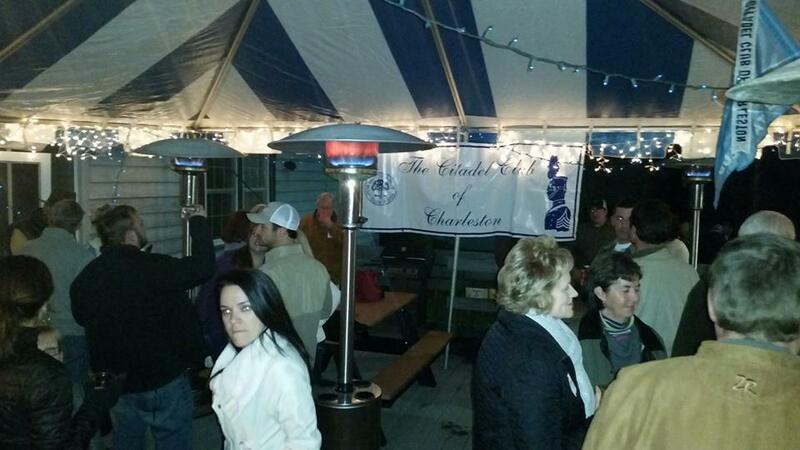 The Charleston Citadel Club Board of Directors would like to thank everyone who came out last night to our Annual Oyster Roast. We had an absolute blast and hope you did too. From the fellowship of all the Citadel grads and supporters to the awesome food to hearing the Commandant, Captain Geno Paluso ’89 speak – it was an all around fantastic time. If you were unable to come, don’t worry we have lots more great events planned for the year. As some of you may be familiar with, the Naval ROTC Unit hosts an annual fundraiser designed to create funds for scholarships. The Bulldog Challenge (BDC) is a 10 k (6.2 mile), team-oriented race throughout The Citadel campus and surrounding Charleston area. Included within the race are various obstacles and challenges to include: portions of the Marine Corps combat fitness test (CFT), Marine corps obstacle course, a simulated casualty evacuation using stretchers, and maneuvering through the marsh. These individual events are designed to test your mental toughness, ability to work within your team, and your physical endurance. Teams are composed of FOUR individuals. Creative costumes are highly encouraged. We are offering CADET DISCOUNTS this year, with a price $140.00 per team ($35.00 per individual). Register as a team of four BEFORE FEBRUARY 1ST in order to be eligible for the discount. Without the discount, it is $200.00 per team, $50.00 per individual. This year, members of the Marine Contingent WILL NOT be participating in the event, they will be needed to run the event. Again, the event is the morning of Saturday February 28, an open weekend. Please contact myself or Cadet Young of November Company if you have any questions. Reorganized and Energized! Over 30 Event Scheduled for 2015! 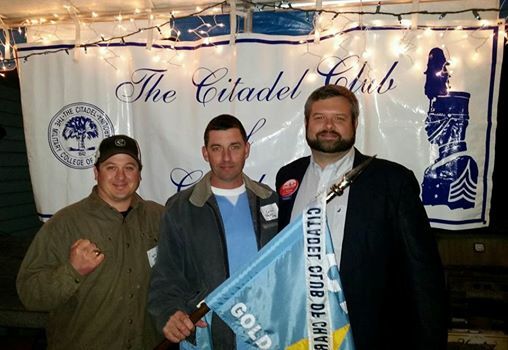 The Citadel Club of Charleston is a great place to meet local people that have a connection to The Citadel and want to participate in events that help the local community and bring The Citadel Community closer together! a Full Featured Website & State of the Art Functions! to only $40 per year! The Club is proud to announce our Relaunch! Our great slate of energized Officers and a Fantastic Board of Directors have really worked hard these last several weeks to get the entire Club reorganized and setup for a hugely successful year in 2015! Bring your Wives, Friends, Girlfriends and Co-Workers! Everyone is welcome at all Club events! The Citadel Club of Charleston is open to everyone and we're here to serve the community. 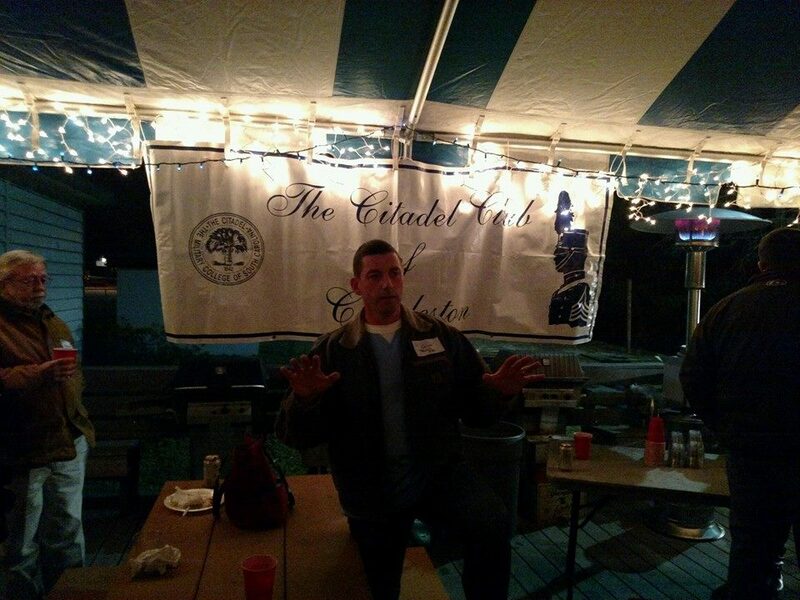 ANYONE can join The Citadel Club of Charleston, being an Alumni is not Required! The only requirement is that you have a positive connection to The Citadel and are interested in being active in the community through both Social and Charitable events. The website, CitadelClub.org, is now fully functional is up to the minute information about the Club's Events and articles about The Citadel and issues that are important to our Community. You can Join the Club and Register for our Events online and use your Credit Card through our Secure Portal. Also, we've added events and lowered dues to only $40 per year! Please check out our upcoming events here! Tired of your old, 'static' Club? We have monthly Happy Hours that move around the Charleston Area and monthly Breakfasts at the Alumni Center along with Big Quarterly Events! The Club is very active in the community and we support several local charities through both volunteering and donations. What is The Citadel Club of Charleston? The mission of the Citadel Club of Charleston is to provide a social atmosphere in which alumni and supporters can meet while raising private support for various needs of the college. We also strive to create a strong networking community in which our members can benefit from each other. We hope you will consider joining the Club, and we look forward to seeing you at the next meeting! 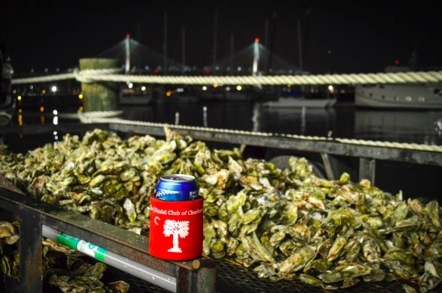 We have over 30 events each year located all over the Charleston Area, we work with local charities, we hold great family friendly events like our Annual Muster, Oyster and Shrimp Parties and our Annual PreKnob Dinner, along with our Monthly Happy Hours that provide a great chance to get together with like minded local people. Copyright © 2015 The Citadel Club of Charleston. All rights reserved. The issue of the “Combat Ring” has resulted in a major uproar, within the membership. Regrettably, much of the information out there is just wrong. I would like to set forth the facts on that ring and advise all of you as to the action already planned by your Executive and Ring Committees to insure the integrity of “The Ring”. First, the action taken by the Board to approve this was in response to requests for a “combat ring”. The service academies and VMI provide this service to their graduates on the basis of individual requests. The combat ring was intended to be available to our graduates in service to our country. Many of these individuals do not want to risk losing their “Citadel Rings” in faraway lands. It was seen as a service to those brave graduates willing to risk the ultimate sacrifice for our county. However, you do not have to be in the military to request the combat ring. It is of course available to all who would request it and are qualified. There are two primary qualifications to be eligible for this combat ring. First, you must be qualified to wear “The Citadel Ring” and second, you must own one. There is no program to push this service but only to offer it upon request. To date, we have sold a total of “0” combat rings. Actions to address your concerns have already been put in motion. The Ring Committee is already set to meet this week. Their report will be advanced to the Executive Committee and then both committees will report to the Board of Directors at the meeting set for 10:00 Saturday morning, January 31st. Until this issue is resolved, the President has immediately suspended the sale of these rings and any requests will be put on hold. Currently, there are none. You are strongly encouraged to contact your District Director and make your wishes known to him or her. Citadel Regimental Band & Pipes Performing "Dixie"
Played on Corps Day 2012, the Citadel's Band and Pipes perform a Confederate classic known to many. PLEASE READ DESCRIPTION BELOW! This was filmed by my mother, and the person telling people to stand up is my grandmother. Both are from Florida, and so am I. So... if you have anything negative to say towards the two, I advise that you keep your mouth shut; no matter if you're a Citadel alumni, from the South, or just ignorant and want to troll.